The cast of "W;t," including Richard Wheeler, M.D., (third from left), tells the story of Vivian Bearing, Ph.D., a 50-year-old professor of 17th century English literature who has been diagnosed with stage four metastatic cancer. Nov. 13, 2018 | UAMS faculty and standardized patients joined faculty and students from the University of Arkansas at Little Rock’s Department of Theatre Arts and Dance to present “W;t,” Oct. 24 in the Rahn Building. 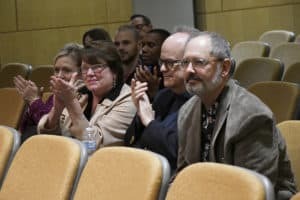 The “Play Reading Remedy” was part of the UAMS Centers for Simulation Education’s celebration of the 25th year of the standardized patient at UAMS. “W;t” is the story of Vivian Bearing, Ph.D., a 50-year-old professor of 17th century English literature who has been diagnosed with stage four metastatic cancer. The play, written by Margaret Edson, looks at Bearing’s interactions with the medical community from her diagnosis, through her treatment and ending with her death. Audience members helped analyze Vivian Bearing’s interactions with the medical community from her diagnosis, through her treatment and ending with her death. Stacy Pendergraft, associate professor of actor training at UA Little Rock, played Bearing and directed the play. Her doctor, Harvey Kelekian, M.D., was played by Richard Wheeler, M.D., professor and executive associate dean for academic affairs in the UAMS College of Medicine (COM). 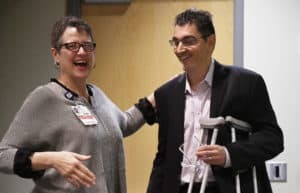 Kostas Arnaoutakis, M.D., associate professor in the COM Department of Internal Medicine’s Hematology/Oncology division, facilitated the group discussions between segments of the play. They were joined by UA Little Rock students Jeremy Matthey, Verda Davenport Booher, Emily Wold and Taylor Green. The play examines several aspects of the patient/physician relationship. One scene focuses on Matthey, who played clinical fellow Jason Posner, M.D., conducting a pelvic exam on Bearing. In an effort to put Bearing at ease, he tells her to relax and recounts stories about his experiences in one of her classes when he was an undergraduate. Some audience members found Posner’s bedside manner off-putting. “I thought if he said ‘Relax’ one more time that I would scream,” said one female audience member during the discussion. Other scenes involved discussions between Bearing and Kelekian; a look at grand rounds with doctors and students examining Bearing; and then finally, Bearing’s death in which a resident orders a Code Blue after forgetting she had signed a Do Not Resituate order. During the discussion, Wheeler said students are taught to relate differently to patients now than when the play was written 20 years ago. “We would never use a harsh tone and jargon like this when talking to a patient now,” he said. But there is still much to learn. Kostas Arnaoutakis, M.D., (right) associate professor in the COM Department of Internal Medicine’s Hematology/Oncology division, facilitated the group discussions. He is shown with Mary Cantrell, M.A., executive director of the Centers for Simulation Education. 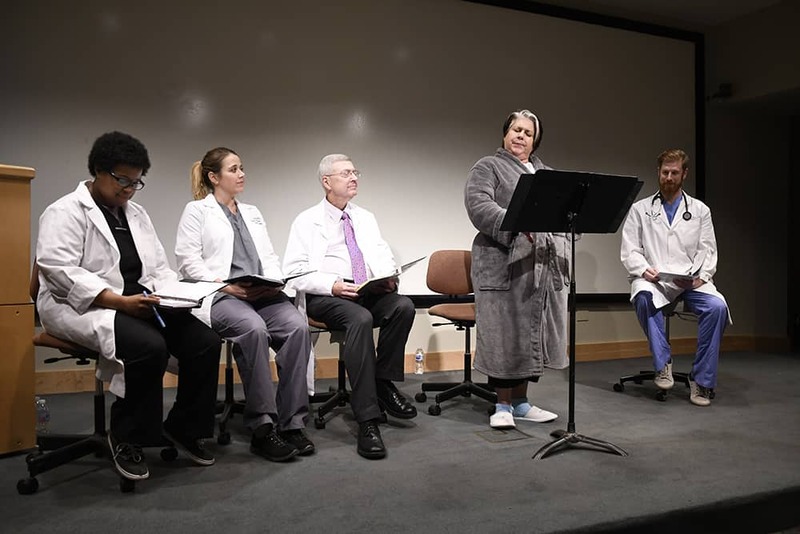 Mary Cantrell, M.A., executive director of the Centers for Simulation Education, said the purpose of the play reading was to bring health care professionals and the public together to watch a scene and then learn from each other’s viewpoint on the scenario. “My hope is that this play reading caused the audience to think about how they speak to patients, and perhaps, helped them see that relationship in a new way,” she said. Two more play readings are planned as part of the standardized patient celebrations — “Miss Evers’ Boys” on Feb. 6 and “The Curious Incident of the Dog in the Night-Time” on April 17.